We have done an incredible amount of car traveling over the past couple of months--over 50 hours. At first I left the kids to be--happily playing video games on Nintendo DS or Leapster. For many hours I enjoyed the peacefulness of a quiet car, until the guilt set in. Certainly we could be doing something educational with all that time. Yes, there are plenty of educational activities to do in the car, but my kids were already accustomed to their car-ride video game time (which is a treat because under normal circumstances video game time is severely limited). Getting them to do anything else in the car brought about loud and angry protests, and heavily interrupted my peaceful quiet (which is also a treat, severely limited under normal circumstances!). Finally I couldn't take it any more. I couldn't stand the thought of those two precious little brains getting mushier and mushier with each passing mile. 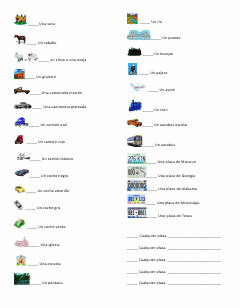 Before our next trip I created a car-ride scavenger hunt in Spanish. I let the kids know that there would be no video games in the car until they found all the items on their scavenger hunt. After that they could play for an hour at a time with hour breaks in between for reading, activity books, flash cards, etc. There were still loud and angry protests, but they came before we got in the car since I gave the boys plenty of advanced notice. This is a move I highly recommend--at your own house you can close the door on loud and angry protests until they quiet down and eventually cease to exist. The scavenger hunt turned out to be lots of fun for all of us. It got the boys (and mom and dad) looking out the windows and took almost two hours. Here is a link to the document. 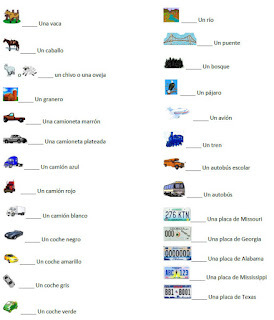 Feel free to modify it to suit the area in which you will be traveling. I love it! We travel a lot and with 4 it is not easy to keep them happy. I used audio books) and sometimes I bring a movie. But this one is definitely smart, practical and fun. I will print it and share in my FB page. This is such a great idea Heather... I will be traveling this month and I was wondering about thing to do during the trip. Thanks for sharing it! I will print it too. I just found your blog thanks to Cecy above. What great ideas you have! I can't wait to try some of them. And I, too, have felt that guilty conflict of wanting some peace to myself vs. letting their minds turn to mush!